The New York entrepreneurs were considerably more enthusiastic than their British counterparts. When the U.S. Steam Frigate Niagara , one of the two principal ships of the Atlantic Cable fleet, arrived in New York on August 18th, 1858, it was the event of the century. 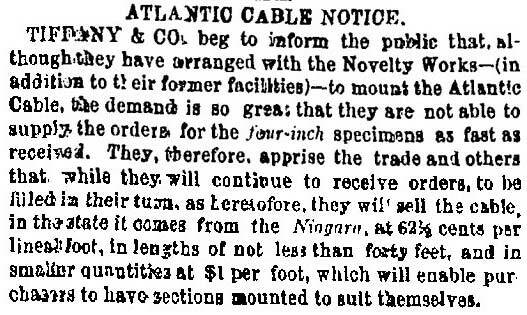 Public interest in the long-awaited success of the cable was high, and the merchants of the city lost no time in cashing in. A one-foot piece of the 1858 cable, secured with a brass ring at each end. At this length the cable can easily be bent to a somewhat smaller radius, although with a strong tendency to spring back to its original shape. It would have been relatively easy to coil long sections of the cable into circles in the tanks of the Niagara and Agamemnon. 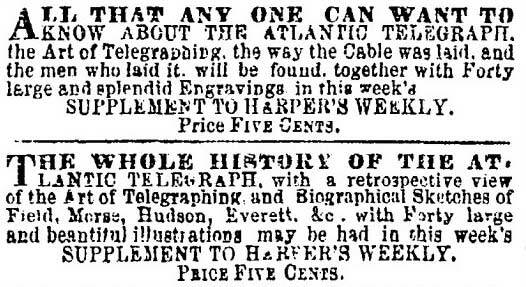 The Atlantic Cable Charm Album was produced by the well-known blank book maker John C. Riker, and Eugene Ely's part appears to have been insetting a thin slice of the 1858 cable into the cover and offering the finished albums for sale. Many examples of souvenirs from 1858 and other years can be seen on this page. 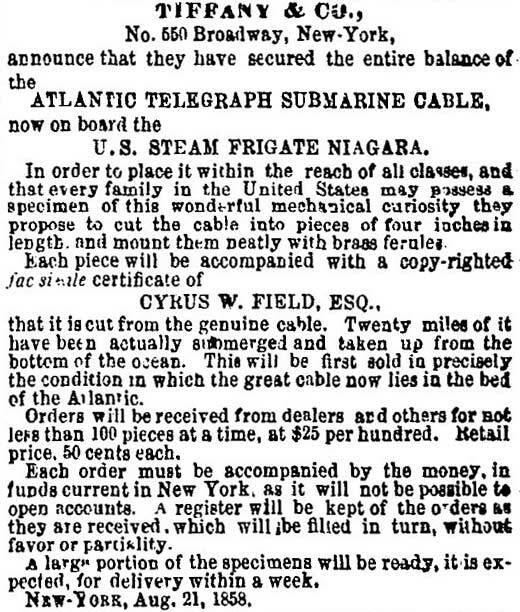 As quickly as the enthusiasm for the cable had sprung up in New York, it vanished just as fast when the cable failed after only a few weeks of intermittent operation, and the remaining unsold pieces of cable were stored and forgotten. In 1974 a company called Lanello Reserves offered 2,000 pieces of cable for sale in a special promotion. 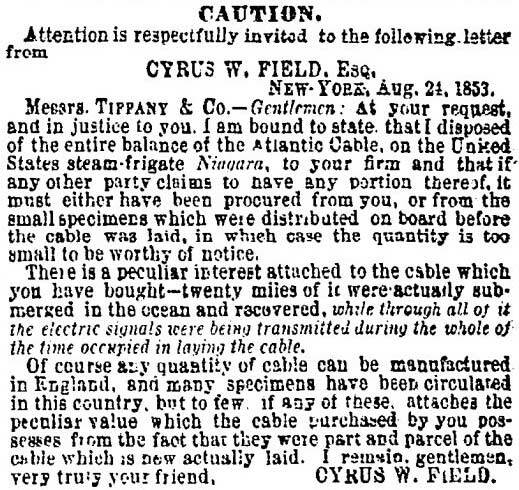 And today, the New-York Historical Society has in its collection 930 pieces of Tiffany cable, many of them still packed for wholesale distribution in wooden crates each filled with 100 pieces of the 4" cable sections. 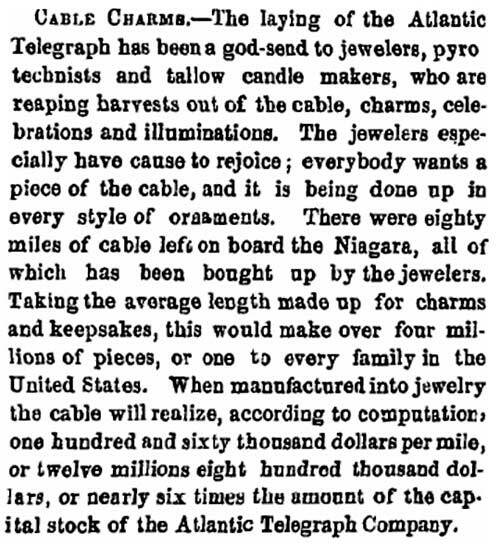 As noted in Tiffany’s advertisement at the top of this page, the wholesale price was $25 per 100 pieces in 1858. 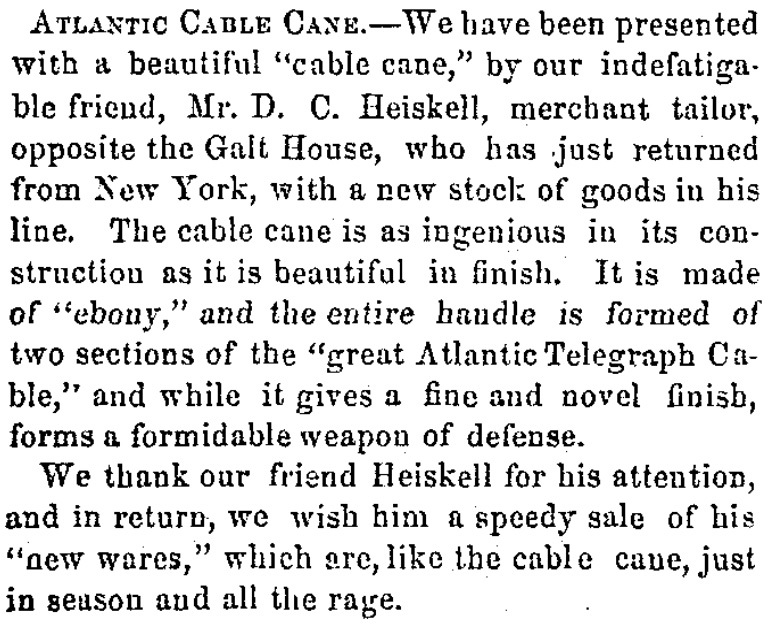 Atlantic Cable Cane.—We have been presented with a beautiful “cable cane,” by our indefatigable friend, Mr D.C. Heiskell, merchant tailor, opposite the Galt House, who has just returned from New York, with a new stock of goods in his line. The cable cane is as ingenious in its construction as it is beautiful in finish. It is made of “ebony,” and the entire handle is formed of two sections of the “great Atlantic Telegraph Cable,” and while it gives a fine and novel finish, forms a formidable weapon of defense. 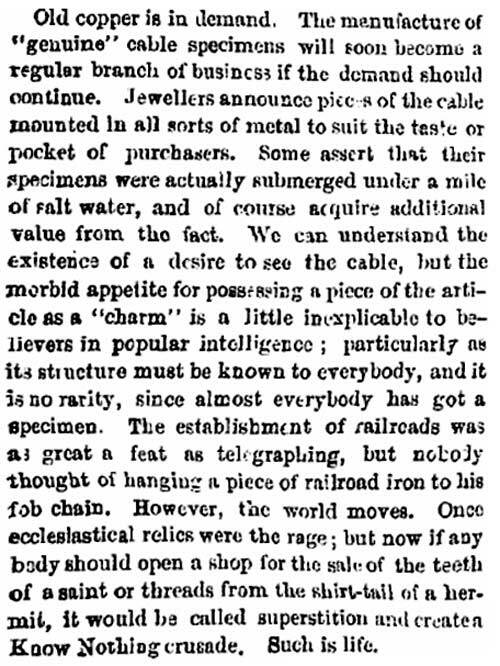 We thank our friend Heiskell for his attention, and in return, we wish him a speedy sale of his “new wares,” which are, like the cable cane, just in season and all the rage. 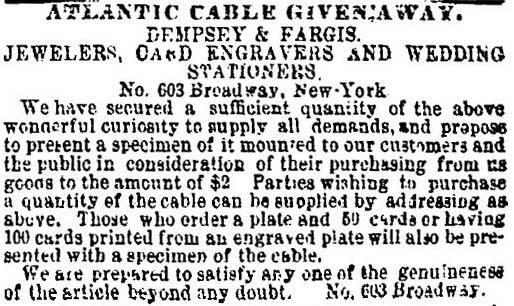 That same issue of the Daily Courier also had three advertisements for cable sections, charms, and specimens from other local merchants. Unlike the Tiffany cable sections, of which thousands were sold, very few cable canes are known, but two examples may be seen here.